My children learned about the days of the week and the months of the year by making calendars. We also took note of the day every morning. On Monday, I told them that today is Monday and yesterday was Sunday and tomorrow is Tuesday. It may take a while before your child fully understands and remembers the days and what yesterday and tomorrow mean. Talking about it each day [briefly!] will help them a great deal. 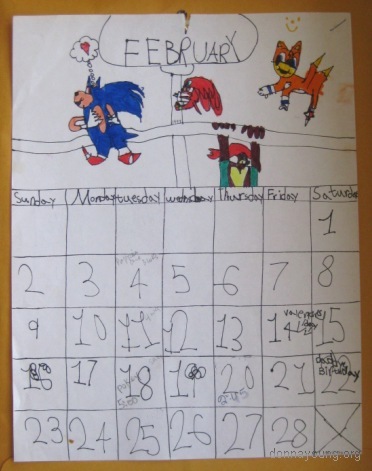 Once they have a general understanding of what a month is and when they are old enough (can count to , at least, 31), have them create a calendar using a blank calendar template or draw the template. The page anchors for the templates are linked at the bottom of this page. I drew the template for the calendar pictured here. Older children could draw the templates; it would be good practice for them to figure out the spacing of the lines. The calendar pictured here was made by my daughter [first grade]. It features Sonic, Tails, Knuckles, and Sally. While they are doing this, have them make two consecutive [or three] months in one sitting to show them that where a month ends, the following month begins on the next day. That seems like a no-brainer, but show it to them anyway or see if they can grasp this on their own. This is a photograph showing where I noted the calendar assignment, or perhaps the completion of the assignment. I placed it in the language arts category. Noticed how I crossed over blocks. The rows that I wrote "made a calendar page" over are Grammar, Reading and Writing. This lesson would also fall into Art. Notice how not neat I am. This planner image is from my 2nd year of homeschooling. Two methods to help children remember how many days are in each of the months. Also has a printable of the poem, Thirty days hath September. This exercise would be for children 10 or older, however, if a younger child wants to color this drawing, that is fine too.